Home » Activities » Where to Exchange Money on Koh Chang? Where to Exchange Money on Koh Chang? Updated for 2017 – 2018 High Season. I was talking to someone the other day about where to exchange money and I realised that I didn’t know which banks or currency exchanges gave the best rates. I knew they differed, but I didn’t know by how much or if there were any that were better than others. Thailand is still largely run on good old, untraceable, cash. There are now debit cards that people use to pay for goods and services and of course credit cards can be used in any large business. Outside shopping malls and resorts, for normal daily life, cash is still king. That is changing with 7-elevens all having contactless payment systems for holders of some debit cards. Alipay, which is used extensively by Chinese vistors can now be used in many shops, restaurants and minimarts in Thailand. But there is still a long way to go before you can visit Thailand and not have to carry cash with you when you want to go shopping, eat out or book a tour. So today I found the best places to exchange money on Koh Chang. With one exception these are all licensed money changers. It’s better to go to a legitimate bank or money exchange. You might think you will get a better rate at a tour agents office or in some random shop, but the chances are you won’t. The problem is that for anyone staying further south than Kai Bae beach, there aren’t any official currency exchanges or banks. Just ATMs and unofficial exchanges. And at the best known currency exchange company, Super Rich. This morning the rate was US$1 = 33 THB and EUR1 = 38.9 THB at their offices in Bangkok. They offer pretty much the best rates in Thailand. When I need cash for a European holiday, I’ll go to their main office in Bangkok, near Centralworld, and exchange Baht for Euros or USD there. If you’re landing at Suvarnabhumi they have a branch on the Basement level of the terminal, near the station for trains into Bangkok. You’ll get a far better rate there than at any of the exchanges elsewhere in the airport. So that’s what we’re aiming for . . . The top three USD and EUR rates are in green. 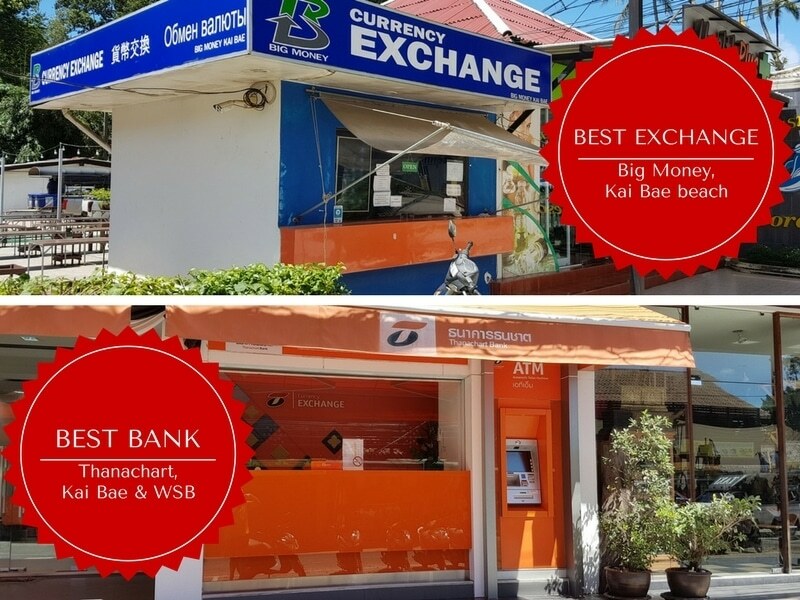 This year the best place to exchange either Euros or US Dollars for Baht on Koh Chang is Big Money in Kai Bae. Located adjacent to the large ‘Goong Kata’ restaurant in the centre of the village. This is 100 metres south of Gajapuri Resort, The Chill and AWA Resort. Last year’s winner was Big Money, Chai Chet. It still offers very good rates but not as good as it’s sister branches on Kai Bae and White Sand beaches. If you want to exchange money at a bank – look for a branch of Thanachart. Easy to spot as they are orange. If you’re staying in Kai Bae or White Sands then you should shop around as there is a big difference in rates. Don’t automatically assume the various exchanges are all going to be the same or that the one closest to your hotel will give you the best rate. Walking a few minutes will save you enough to buy a beer. And if you’re staying in the south of the island, then it’s best to exchange money before you get to your hotel or take a taxi or scooter to the more developed beaches where you’ll get a much better rate. Don’t assume that because a you get a good rate for Euros at one exchange, they will also offer a good rate for USD. And vice versa. Is buying Thai Baht in advance before you come to Thailand a good idea? No. You’ll get a rate that costs you 10% more money than the worst rate in Thailand. Should you exchange money at Suvarnabhumi Airport? No. If you are talking about the currency exchanges in the Baggage Claim and Arrivals area. These give very low rates compared to banks elsewhere in Thailand. Yes. If you know where to go. As it is possible to get good rates at the airport. Here’s how . . .
Once you’re in the Arrivals hall, follow the signs for the Airport rail link and take the elevator down to Level B1 of the terminal. Then walk to the station. There’s an invisible dividing line between airport property and that of the State Railway of Thailand. Once you cross this line you get better rates. It makes life easier if you don’t have to carry a lot of cash and there are ATMs almost everywhere you go in Thailand. You’ll find them dotted around Koh Chang. So you can take cash from these easily. BUT . . . . note that there is a 200 Baht fee per transaction. This is levied by the Thai bank. It is separate from any fees your own bank might impose. And you may well find that you are limited to 10,000 Baht per transaction – so are effectively paying a minimum of 2% fee for the withdrawal. This is in addition to any fees your own bank imposes. The bank that usually has the highest limit per withdrawal is Krungsri Ayudya ( yellow ATMs ) Their limit is 30,000 Baht per withdrawal. If you get a low limit, say 10,000 Baht, then it’s often due to your own bank putting a low limit to prevent fraud. I’ve noticed this happen often with cards from UK banks. Therefore, don’t take a small amount of cash out unless it is absolutely necessary. You also have to factor in any fees that your bank at home levies. Some cards specifically for overseas travel don’t have any fees – which is great. Many do though and they’re often hidden in small print. As far as the exchange rate used for ATM withdrawals is concerned, this isn’t set by the Thai bank and isn’t set by your bank. It’s set by Visa or Mastercard ( depending on which card you are using to make the withdrawal. ) So you’ll have to check their website for the actual rate you are getting. It may or may not be better than the Thai bank rate. I’ve no idea. It’s not 1997. Thanks Ciaran. In addition to the charges from your own bank, the Thai banks add on a fee for ATM withdrawals. You can avoid this by withdrawing over the counter in a bank. thank you very much for your valuable information. I am going to Thailand for October and I will be spending almost three weeks on Koh Chang. I have been there a few times since 2006. After reading your info, I will be changing my cash on the Island. I have been checking out different ways to get the best value for my currency and your info is the best I have come across. The banks at home will screw you with their charges. I can arrange a transfer from Suvarnabhumi Airport to Koh Chang at night. If you;re picked up at 2am then you’ll be on the first ferry ti Koh Chang at 6.30am. Or stay the night at a hotel near the airport and then take the minibus form the airport to Koh Chang. The first is at 07:50. The banks have indoor areas – but often the exchange is separate. So you have to get the money then walk inside the bank. The small booths don’t have anywhere indoor or secure. In Klong Prao, the pink GSB has the exchange counter inside the office. Likewise Krungthai on White side is inside. Which of these has an indoor area to do business? I know some are street front kiosks that when dealing with large sums of money people might not feel comfortable checking/double checking their money in the open. And is there any limit to the amount they would be happy to change at a time? We would like to pay for everything with cash as the rate is far better then the banks rate. Also the ATM has a daily limit which wont suit the amount i need to withdraw. Hi Ian. I have to disagree. We were selling Baht for some time until the police cracked down on unlicensed operators. So almost daily we were going up to Whitesands to change our USD and EUR back into Baht at Thanachart or Krungsri. Even after Big Money arrived, and they’re next door to us, there were always a few points better to be had from those banks. Furthermore SCB’s rate appears to be consistently worse than the others. Google for daytodaydata.net for rate comparisons across Thailand. The national bank rates displayed are the same as those available at the Koh Chang branches it would appear.